White pine blister rust, a widely known tree disease in North America, is caused by the introduced fungus Cronartium ribicola. C. ribicola is a heteroecious (requires two hosts to complete its lifecycle) and macrocyclic rust fungus . The two host groups of this fungus are five-needle Pinus spp. and plants of the currant / gooseberry genus (Ribes spp.). Spores on infected pines are carried by wind to infect Ribes spp. during spring and spores on infected Ribes spp. are also disseminated by wind to infect five needle pines during autumn. Large-scale weather events that bring moist conditions to a region increase opportunities for infection and spore travel distance. Infection is also influenced by topographic features combined with microclimate, such as in saddles or on mountaintops frequented by late summer fog. According to Foster and Wallis (1974), infected trees can be identified by the presence of dead branches in the crown. 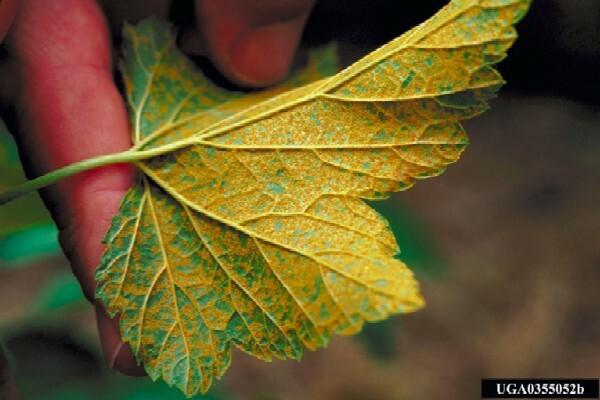 Infections on young stem and branch tissues are characterised by swollen or sunken areas with discoloured margins. On older stems, resinosus is often present in cankered regions. In the spring, blister-like aecia are produced on cankered stems and release large quantities of powdery whitish-orange spores. USDA (Undated) indicates that Cronartium ribicola favours cool, moist conditions during summer and autumn. According to Scharpf (1993), C. ribicola's North American hosts are eastern white pine (Pinus strobus), western white pine (P. monticola), sugar pine (P. lambertiana), limber pine (P. flexilis), whitebark pine (P. albicaulis), bristlecone pine (P. aristata and P. longaeva), foxtail pine (P. balfouriana), and Mexican white pine (P. strobiformis). In addition, it infects all currants and gooseberries (Ribes spp. ), its alternate hosts. McDonald et al. (2006), demonstrate that some species in the family Orobanchaceae (Pedicularis racemosa and Castilleja miniata) are alternate hosts to C. ribicola in a natural ecosystem of North America. McDonald et al. 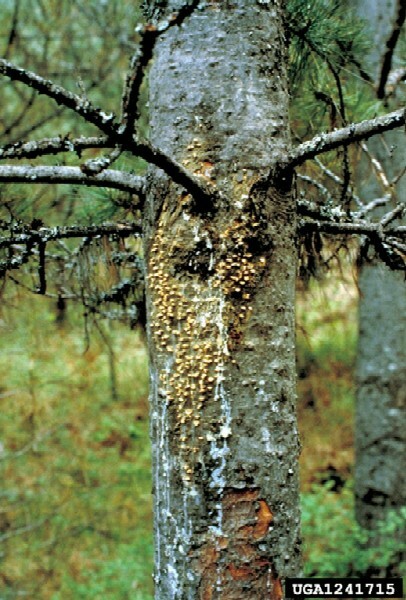 (2006) summary states \"White pine blister rust disease, caused by the introduced pathogen Cronartium ribicola, has severely disrupted five-needled pine ecosystems in North America. A 100-year effort to manage this disease was predicated in part on the premise that the pathogen utilizes only species of Ribes (Grossulariaceae) as alternate hosts on this continent. The current study presents the first conclusive demonstration that some species in the family Orobanchaceae (Pedicularis racemosa and Castilleja miniata) are functioning as alternate hosts in a natural ecosystem of North America. This finding has implications for improving our understanding of epidemiology, pathogen adaptation and host–pathogen interactions within white pine blister rust\". Cronartium ribicola begins on Ribes spp. leaves when teliospores produce basidiospores, which are carried to five-needle Pinus spp. (Maloy, 2001). Recommended citation: Global Invasive Species Database (2019) Species profile: Cronartium ribicola. Downloaded from http://www.iucngisd.org/gisd/species.php?sc=550 on 22-04-2019. 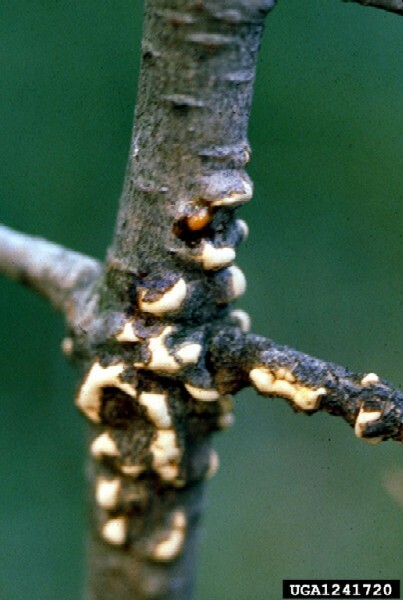 According to Foster and Wallis (1974), the fungus grows in the phloem and bark with no visible symptoms for at least three years, when white blister-like fungal fruiting bodies (aecia) break through the bark. C. ribicola is particularly serious in young trees; very few survive infection and are killed within a few years. 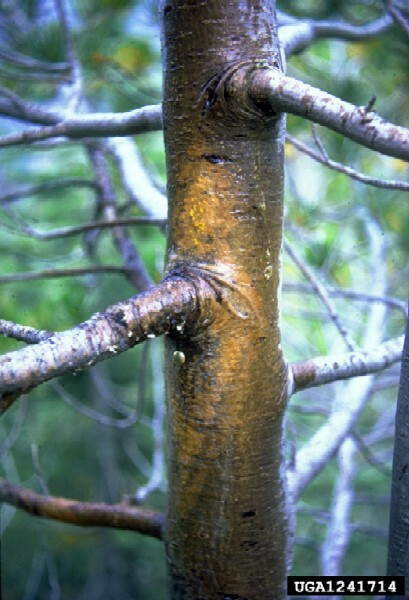 Cankers on young trees generally occur within 2.5m of the ground, where environmental conditions are favourable. Open-grown trees with persistent branches are more likely to be infected than trees with self-pruned branches growing in dense stands. In older trees, the rust is often confined to isolated branches or the upper crown so that only part of the tree is killed. According to Scharpf (1993), some stands have been completely destroyed in the western United States and Canada. C. ribicola has caused more damage and costs more to control than any other conifer disease in North America. Physical: According to NRC (Undated), cultivated black currants (Ribes nigrum), which are more susceptible to the rust, should be removed if growing within a 1.5 km distance from susceptible pine hosts. Pruning of lower branches and high stem density are also recommended for plantation forestry. In addition to the removal of currant and gooseberry plants near infected ornamental trees, it is also advisable to remove diseased branches. This should be done in the spring when the orange-yellow blisters make rust detection easy. Infected branches should be pruned 20 to 25cm below the diseased area. Although excision of existing cankers from stems may be unsuccessful since detection of infected tissue can be difficult, certain reccomendations can be made to improve success. For example, trunk cankers should be treated by removing all diseased bark and stripping off healthy bark 10 to 13cm wide around the canker. Trees that have been treated should be inspected yearly to detect additional infections that may have escaped treatment. Please follow this link to Maloy, O. C. 2003. White pine blister rust that outlines symptoms, disease cycle and epidemiology and management including establishment of 'rust hazard zones' and eradication. Informations on Cronartium ribicola has been recorded for the following locations. Click on the name for additional informations. Geils,. B. W., Hummer,. K. E. and Hunt,. R. S. 2010, White pines, Ribes, and blister rust: a review and synthesis. Forest Pathology, 40: 147�185. Summary: For over a century, white pine blister rust (Cronartium ribicola) has linked white pines (Strobus) with currants and gooseberries (Ribes) in a complex and serious disease epidemic in Asia, Europe, and North America. Because of ongoing changes in climate, societal demands for forests and their amenities, and scientific advances in genetics and proteomics, our current understanding and management of the white pine blister rust pathosystem has become outdated. Here, we present a review and synthesis of international scope on the biology and management of blister rust, white pines, Ribes, and other hosts. In this article, we provide a geographical and historical background, describe the taxonomy and life cycle of the rust, discuss pathology and ecology, and introduce a series of invited papers. These review articles summarize the literature on white pines, Ribes, and blister rust with respect to their status, threats, and management through genetics and silviculture. Although the principal focus is on North America, the different epidemics in Europe and Asia are also described. In the final article, we discuss several of the key observations and conclusions from the preceding review articles and identify prudent actions for research and management of white pine blister rust. Hummer, K. E. and Dale, A. 2010, Horticulture of Ribes. Forest Pathology, 40: 251�263. Summary: The genus Ribes L., known as currants and gooseberries, contains more than 150 diverse species indigenous throughout the northern hemisphere and along the Rocky Mountain, Sierra Nevada and Sierra Madres in North America through mountain ranges of Central America to the Andes in South America. Beginning in the 1400s, four main crop types, black currants (Ribes, subgenus: Ribes, section: Botrycarpum), red and white currants (Ribes, subgenus: Ribes, section: Ribes) and gooseberries (Ribes, subgenus: Grossularia) were domesticated from European species. American and Eurasian species were selected and combined into the germplasm base of European and American breeding programmes in the 1900s. Black currants (R. nigrum and hybrids) are a major economic crop in many European countries but are minor in North America, although they can be produced successfully in the northern states and southern portion of the Canadian provinces. Ribes plants can be hosts for white pine blister rust, caused by Cronartium ribicola. This disease was introduced from Asia through Europe into North America ca. 1900. Restrictions were imposed on currants and gooseberries in the United States when the rust was observed on this continent. Although some states have recently repealed these restrictions, by 2009, 12 states continue to have 40-year-old laws prohibiting or restricting Ribes cultivation. The purpose of this paper is to describe the cultivation of currants and gooseberries and their interaction with rust. Ribes production has a potentially great economic value in American, niche markets that could help sustain small-acreage, berry farmers. Summary: The preceding articles in this series review the history, biology and management of white pine blister rust in North America, Europe and eastern Asia. In this integration, we connect and discuss seven recurring themes important for understanding and managing epidemics of Cronartium ribicola in the white pines (five-needle pines in subgenus Strobus). Information and action priorities for research and management of the pathogen, telial and aecial hosts, and their interactions are listed in a detailed Appendix. Syntheses focused on genetics, plant disease, invasive species or forest management have provided alternative but knowledgeable lessons on the white pine blister rust pathosystem. Two critical issues for the conservation of white pines are to sustain ecosystems affected by blister rust and to maintain genetic diversity for adaptive traits such as disease resistance. Forest genetics includes tree improvement and molecular techniques for research; their application can increase rust resistance by artificial and natural selection. Silviculture augments genetics with methods to deploy and enhance resistance as well as to regenerate and tend white pine stands. Although cultivated or wild Ribes might serve as inoculum sources, silviculture and horticulture can reduce the risk of serious impacts from blister rust using genetics for breeding and epidemiology for hazard assessment and disease control. Climate change threatens to cause major alterations in temperature and precipitation regimes, resulting in maladapted conifers succumbing to various diseases and insect outbreaks. In contrast, many white pine species have broad ecological ranges and are tolerant of harsh environments�traits that permit successful establishment and growth over wide geographic and altitudinal zones. Given appropriate management, white pines could thrive as valuable commercial and ecologically important keystone species. In an uncertain environment, adaptive management provides a learning and participatory approach for sustaining resilient ecosystems. Jurgens, Joel A, Blanchette, Robert A, Zambino, Paul J, David, Andrew. Histology of white pine blister rust in needles of resistant and susceptible eastern white pine. Plant Disease. 87(9). 2003. Department of Plant Pathology, University of Minnesota, 1991 Upper Buford Circle, 495 Borlaug Hall, Saint Paul, MN, 55108-6030, USA. Kim, M.-S., Klopfenstein, N. B., Ota, Y., Lee, S. K., Woo, K.-S. and Kaneko, S. 2010, White pine blister rust in Korea, Japan and other Asian regions: comparisons and implications for North America. Forest Pathology, 40: 382�401. Summary: This article briefly reviews the history of white pine blister rust, attributed to Cronartium ribicola, and addresses current research and management issues in South Korea, Japan and other regions of eastern Asia (China, Russia and Himalaya). For each region, the distribution, damage, aecial hosts, telial hosts and management of C. ribicola and other blister rust fungi on native and introduced white pines are summarized. In addition, blister rust behaviours in eastern Asia and North America are compared; and the potential evolutionary and management implications are discussed. Summary: Since introduced a century ago, Cronartium ribicola has devastated many populations of North American white pines. However, significant genetic resistance to white pine blister rust occurs naturally and can be exploited. In this review, we discuss the progress and different approaches to breeding for resistance in North American white pines. Three broad categories of resistance are: (1) ontogenetic resistance, (2) R-gene resistance and (3) partial resistance. Ontogenetic resistance is associated with increased host age and indicated by higher susceptibility to infection in primary needles and young seedlings then in grafts and older trees. R-gene resistance (major gene resistance) is an example of the classic gene-for-gene system common in many rust diseases. R-gene resistance provides immunity but may not be durable. Host resistance and the corresponding rust virulence which defeats it are well described for sugar pine and western white pine. Host plants with partial resistance are able to retard or tolerate disease development without eliminating the pathogen. Partial resistance is also called slow-rusting resistance or low-level resistance and is revealed in seedlings by several responses, including slow-canker-growth, difficult-to-infect, needle-shed and bark-reaction. Most of these seedling responses are presumed to be multigenic; but needle-shed may be controlled by recessive genes. Long-term, field trials for verification of screening and selection results are sparse. Although 100% higher survival of selected material over unselected occurs in some trials, mortality is high under conditions of high hazard and heavy inoculum load. In several, long-term trials, some full-sib crosses expressed a strong phenotypic resistance that indicates specific combining ability between complimentary parents. These and other observations suggest that we might yet find strong and durable resistance. Study of Eurasian white pines infected by blister rust fungi could help us better understand endemic pathosystems. Different strategies are identified for deploying material selected for either R-gene or partial resistance. Current research suggests that resistance is more complex than previously modelled, but new molecular techniques offer useful methods for investigating the white pine blister rust pathosystem. Maloy, O. C. 2003. White pine blister rust. The Plant Health Instructor. Natural Resources Canada (NRC) n.d. White Pine Blister Rust. Canadian Forest Service. Ostry, M. E., Laflamme, G. and Katovich, S. A. 2010, Silvicultural approaches for management of eastern white pine to minimize impacts of damaging agents. Forest Pathology, 40: 332�346. Summary: Since the arrival to North America of Cronartium ribicola, management of eastern white pine has been driven by the need to avoid the actual or, in many areas, the perceived damage caused by white pine blister rust. Although white pine has lost much of its former dominance, it remains a valuable species for biotic diversity, aesthetics, wildlife habitat and forest products. Understanding its silvics and damaging agents provides a sound basis for the silvicultural activities of site selection, regeneration and stand tending. The species can be successfully grown in many locations despite herbivory, competition, white pine weevil and blister rust. Forest managers can minimize damage by applying knowledge of local conditions (climate, soils, physiography and vegetation) to hazard assessment, site selection and preparation, vegetation management, and pruning. With appropriate management and a long-term commitment, many eastern forests can be beneficially reforested to eastern white pine with little impact from blister rust and other damaging agents. Richardson, B. A., Ekramoddoulah, A. K. M., Liu, J.-J., Kim, M.-S. and Klopfenstein, N. B. 2010, Current and future molecular approaches to investigate the white pine blister rust pathosystem. Forest Pathology, 40: 314�331. Summary: Molecular genetics is proving to be especially useful for addressing a wide variety of research and management questions on the white pine blister rust pathosystem. White pine blister rust, caused by Cronartium ribicola, is an ideal model for studying biogeography, genetics, and evolution because: (1) it involves an introduced pathogen; (2) it includes multiple primary and alternate hosts occurring in large, relatively undisturbed ecosystems; (3) some hosts exhibit endemic resistance; and (4) the disease interaction is long enduring. Molecular techniques are used to investigate population genetics, phylogenetics, hybrids, and proteomics in white pine (Pinus, subgenus Strobus) and blister rust (Cronartium) and the genetics of resistance and virulence in the blister rust pathosystem. These techniques include genetic markers, mapping, microarrays, sequencing, association genetics, genomics, and genecology. Molecular genetics contributes to gene conservation, breeding for resistance, and ecosystem management. Schwandt, J. W., Lockman, I. B., Kliejunas, J. T. and Muir, J. A. 2010, Current health issues and management strategies for white pines in the western United States and Canada. Forest Pathology, 40: 226�250. Summary: The introduced pathogen Cronartium ribicola, cause of white pine blister rust, has spread across much of western North America and established known infestations within all but one species of white pine endemic to western Canada and the United States. Blister rust damage to severely diseased trees reduces reproduction and survival. Severe losses in white pine populations have resulted in site conversions to other species and seriously impacted resource values for timber, wildlife, watershed, recreation, aesthetic and other ecosystem services. 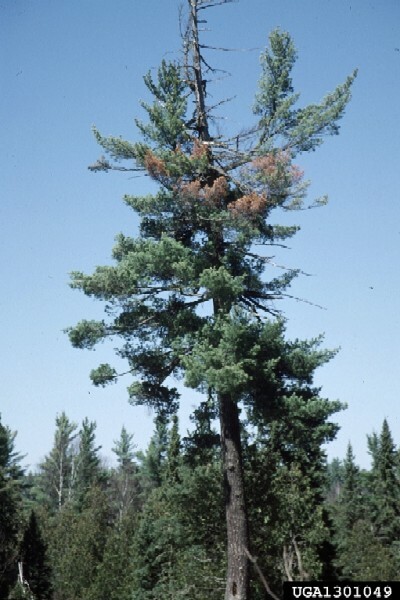 In addition to blister rust, other major forest health threats and challenges to sustaining or restoring white pine populations are infestations of other pathogens, insects, fire, management practices that favour other tree species, and climatic change. Recent, large-scale outbreaks of mountain pine beetle have raised concerns for the viability of some white pine populations. In the 1960s, forest disease management for western white pine and sugar pine shifted from Ribes eradication to planting seedlings selected for better survival and resistance to blister rust. Seed orchards for producing improved white pines have been established, but deployment of that improved stock is hampered by a lack of planting opportunities. The inheritance and mechanisms of resistance are best known for western white pine and sugar pine; but new work is extending an understanding of genetics to all the western species of white pine. Current management efforts are focused on locating and protecting individual trees resistant to blister rust and assessing their disease resistance and other adaptive traits. In response to the threats from blister rust, the strategic goal is to sustain or restore viable white pine populations in western forest ecosystems. 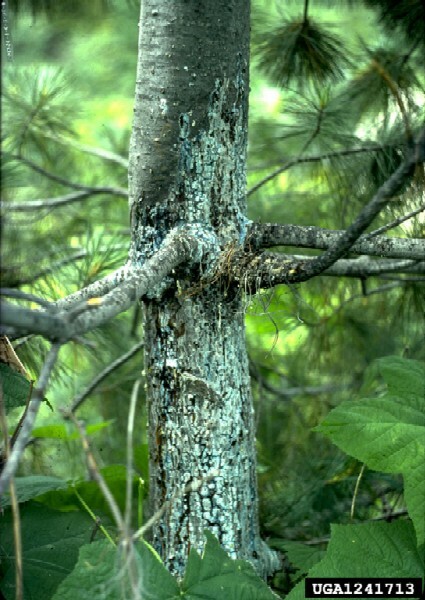 The four action components of the strategy are: (1) conserve genetic resistance to C. ribicola; (2) reduce the risk of adverse impact in stands currently uninfested; (3) restore and maintain white pines where blister rust is causing impacts and (4) assess and monitor the health and management of white pines. Successful implementation requires long-term support for coordinated efforts of management and research agencies, forest industry and an informed public. Summary: Eight white pine species are widely distributed among the forests of western Canada and the United States. The different forest communities with these species contribute biodiversity to the western landscape. The trees themselves provide various ecosystem services, including wildlife habitat and watershed protection. White pine communities range in elevation from lower to upper treeline, in successional stage from seral to climax, and in stand type from krummholz to closed-canopy forest. Many white pine species are moderately to strongly fire-dependent for regeneration; several species are extreme stress tolerators and persistent on harsh sites. Among the white pines are the oldest-living trees, the world�s largest pines, species dependent on birds for seed dispersal, species important for grizzly bear habitat and species of high commercial timber value. The principal threats to white pine populations are blister rust (Cronartium ribicola, pathogen), fire suppression, succession, mountain pine beetle and climate change. Severe population declines in several white pine species are attributed to losses caused by these factors acting either alone or together, and sometimes in concert with logging and other land-use changes. The importance and particular interactions of these threats vary by region and species. For example, many northern and western populations of whitebark pine are seriously declining from a combination of mountain pine beetle outbreaks and severe blister rust infestations. As whitebark pines provide many keystone services on high-elevation sites, their loss would impact forest composition and structure, succession, biodiversity, and ecosystem services. Although there are serious challenges to science-based management and conservation (especially in remote American wilderness areas), prompt and effective intervention promoting regeneration of blister rust-resistant white pines could mitigate these severe impacts. Zambino, P. J. 2010, Biology and pathology of Ribes and their implications for management of white pine blister rust. Forest Pathology, 40: 264�291. Summary: Ribes (currants and gooseberries) are telial hosts for the introduced and invasive white pine blister rust fungus, Cronartium ribicola. Knowledge of wild and introduced Ribes helps us understand the epidemiology of blister rust on its aecial hosts, white pines, and develop disease control and management strategies. Ribes differ by species in their contribution to initial establishment and subsequent intensification of blister rust. Their significance to pine infection depends on their inherent capacities to become infected and support spore production, their abundance and environmental interactions. Ribes and white pines are adapted to disturbance and frequently co-occur in forest and woodland ecosystems. Differences in light and moisture requirements affect how long various species of Ribes occupy a site. Natural or artificial selection increases rust resistance in white pines, Ribes, and other host genera; but selection also affects virulence and aggressiveness of C. ribicola. Blister rust pathosystems evolve. Local pathosystems wherein the rust and its hosts coexist with reduced damage could arise by several processes. Zeglen, S., Pronos, J. and Merler, H. 2010, Silvicultural management of white pines in western North America. Forest Pathology, 40: 347�368. Summary: Since the introduction prior to 1915 of white pine blister rust (Cronartium ribicola) into the forests of western North America, many populations of native white pine species have seriously declined. Because western white pine (Pinus monticola) and sugar pine (P. lambertiana) are highly valued timber species, their silviculture under intensive management is well-documented. The silviculture of other white pine species has received less attention but is no less important. For all western species, silvicultural management is a key component for sustaining and restoring viable white pine populations. This review examines approaches for assessing and reducing blister rust hazard, regenerating white pine stands, and tending established stands to reduce damage and impact from blister rust. Hazard and risk ratings provide means for assessing the potential severity of blister rust infestation and its probable impacts on management. An epidemiological simulation model is available for describing complex pathosystem interactions, their consequences on white pine growth and survival, and likely outcomes of silvicultural activities. Until the 1960s, Ribes eradication was the principal method for blister rust control; it is now rarely used except for high-value trees. The choices of harvest and site preparation methods are critical for successful white pine regeneration. As host responses to blister rust infection are inherited, regeneration is an opportunity to increase seedling survival and disease resistance. For artificial regeneration, the western genetics programmes provide improved planting stock. For natural regeneration, the selection and retention of well-adapted white pines as seed sources can enhance stand genetics. Thinning and pruning are common silvicultural activities for tending stands and are readily modified for blister rust-infested stands. Although biological and chemical agents have been used, their performance has been less than satisfactory. Likewise, genetics and other silvicultural practices have also demonstrated limited success in blister rust control. An alternative, adaptive approach could use both silvicultural and genetic techniques to mitigate impacts and maintain white pines. Summary: China has 12 taxa of white pines (subgenus Strobus), including species of wide distribution valuable to plantation forestry and species of rare endemics only distantly related to other white pines. The most important forest diseases of these white pines are caused by the blister rust fungi of the genus Cronartium that alternate to telial host species of Ribes and Pedicularis. The most serious infestations have occurred in southwestern China on Pinus armandii and in northeastern China on P. koraiensis. The blister rust pathogen on P. armandii has usually been identified as Cronartium ribicola. Several lines of evidence, however, imply this pathogen on P. armandii is different from a pathogen on P. koraiensis that appears more closely related to C. ribicola in North America, Europe, and other Asian countries. In China, C. ribicola is designated as a quarantine pest. Silvicultural control of blister rust relies on pruning and thinning infected trees, herbicide removal of telial hosts, and chemical treatment of blister rust cankers. Although plantation forestry is important in China, little information is available on the genetics of resistance in Chinese white pines to native blister rust fungi. Challenges and opportunities are identified in forest management and research for disease assessment and control, rust systematics and biology, and genetic interactions in the white pine blister rust pathosystem. Allen, E.; D. Morrison; G. Wallis; A. Thomson and B. Gardiner, 2002. White pine blister rust. Common Tree Diseases of British Columbia. Canadian Forest Service. Campbell, Elizabeth M and Antos, Joseph A. Distribution and severity of white pine blister rust and mountain pine beetle on whitebark pine in British Columbia. Canadian Journal of Forest Research. 30(7). 2000. 1051-1059. Groupe de Recherche en Ecologie Forestiere, Universite du Quebec a Montreal, Succursale Centre-ville, Montreal, PQ, H3C 3P8, Canada. Dahir, S. E. and Carlson, J. E. Cummings. Incidence of white pine blister rust in a high-hazard region of Wisconsin. Njaf (Northern Journal of Applied Forestry). 18(3). 2001. 81-86. Department of Natural Resources, 3911 Fish Hatchery Rd., South Central District Office, Madison, WI, 53711, USA. Farr, D.F. ; Rossman, A.Y. ; Palm, M.E. & McCray, E.B. Unadted. Systematic Botany & Mycology Laboratory. Fungal Databases. United States Department of Agriculture, Agricultural Research Services. Goheen, Ellen Michaels., Goheen, Donald J., Marshall, Katy., Danchok, Robert S., Petrick, John A.and White, Diane E. The status of whitebark pine along the Pacific Crest National Scenic Trail on the Umpqua National Forest. General Technical Report, Pacific Northwest Research Station, USDA Forest Service.(530). 2002. 1-17. Hansen & Lewis (Eds.) 1997. Compendium of conifer diseases. APS Press. Hunt, Richard S. White pine blister rust, root disease, and bears. Western Journal of Applied Forestry. 15(1). 2000. 38-39. Pacific Forestry Centre, Canadian Forest Service, 506 W. Burnside Rd., Victoria, BC, V8Z 1M5, USA. Hunt, R. S. Can solid deer protectors prevent blister rust from attacking white pines? Canadian Journal of Plant Pathology. 24(1). 2002. 74-76. Pacific Forestry Centre, Canadian Forest Service, 506 W. Burnside Road, Victoria, BC, V8Z 1M5, Canada. Imazu, Michio., Azbukina, Zinaida M., Kakishima, Makoto., Fukushima, Kazutaka., Nishimura, Kazuko and Miyaji, Makoto. Identification of a rust fungus on Pinus pumila collected in the North Kurils, Russia. Mycoscience. 41(2). 2000. 139-144. Research Center for Pathogenic Fungi and Microbial Toxicoses, Chiba University, Inohana, Chuo-ku, Chiba, 260-8673, Japan. Johnson, D. W and Jacobi, W. R. First report of white pine blister rust in Colorado. Plant Disease. 84(5). 2000. 595. USDA Forest Service, Lakewood, CO, 80225-0127, USA. Reinhart, Daniel P., Haroldson, Mark A., Mattson, David J. and Gunther, Kerry A. Effects of exotic species on Yellowstone s grizzly bears. Western North American Naturalist. 61(3). 2001. 277-288. Resource Management, U.S. National Park Service, Yellowstone National Park, WY, 82190, USA. Scharpf, R.1993. Diseases of Pacific Coast conifers, U.S. Department of Agriculture Handbook 521. Smith, Jonathan P and Hoffman, James T. Status of white pine blister rust in the Intermountain West. Western North American Naturalist. 60(2). 2000. 165-179. School of Forestry, Northern Arizona University, Flagstaff, AZ, 86011, USA. Smith, J. P., Hoffman, J. T., Sullivan, K. F., Van Arsdel, E. P and Vogler, D. First report of white pine blister rust in Nevada. Plant Disease. 84(5). 2000. 594. School of Forestry, Northern Arizona University, Flagstaff, AZ, 86011, USA. Southwest Oregon Forest Insect and Disease Service Center (SWOFIDSC), Undated.White Pine Blister Rust USDA Forest Service. USDA (United States Department of Agriculture) Undated. 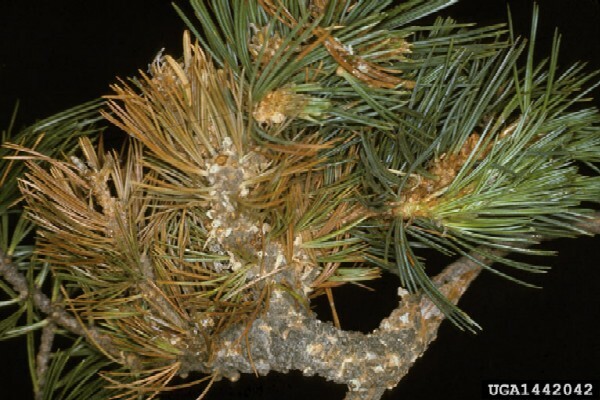 Forest Disease Management Notes: White Pine Blister Rust. Forest Service Pacific Northwest Region. Zeglen, Stefan. 2002. Whitebark pine and white pine blister rust in British Columbia, Canada. Canadian Journal of Forest Research. 32(7). Vancouver Forest Region, British Columbia Ministry of Forests, 2100 Labieux Road, Nanaimo, BC, V9T 6E9, Canada.